Sabato 13 gennaio – The Lab. 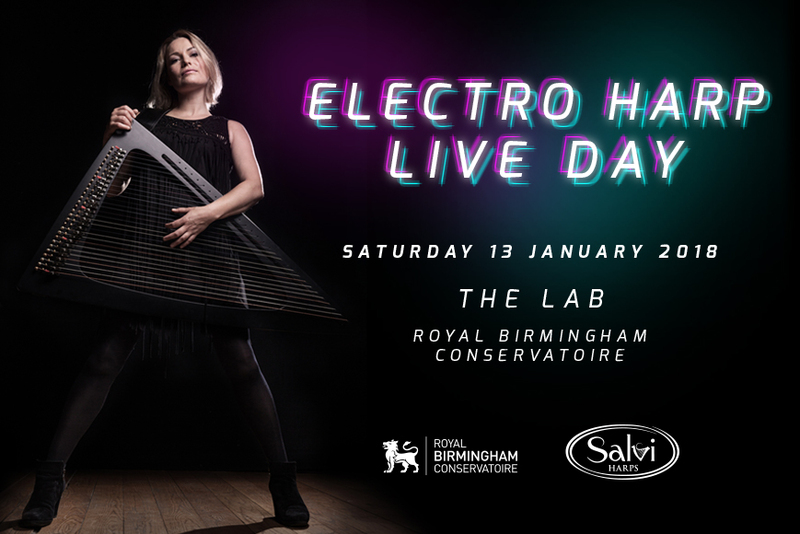 You are warmly invited by private invitation to the World’s first Electro Harp Live Day at the Royal Birmingham Conservatoire. Hosted by Eleanor Turner and sponsored by Salvi Harps, this 100% FREE day of music will be packed with 50 minute long sessions to educate, inspire and empower you in the spheres of composition and performance using electronic and electro-acoustic harps. Bow Brand strings are generously supporting the creation of a new work, composed on the day itself, by Dr James Dooley and Ailie Robertson, with your essential input, using the latest gesture-controlled software, Ableton Live and additional hardware in the form of loopers and pedals. No prior knowledge of any of these things is needed! There are two concerts, 2pm and 7.30pm, with folk band Ranagrí finishing off the evening in high spirits. A complete list of workshops and details of the performances are online at www.eleanorturner.biz on the Electro Harp Live page. There is a link to a booking form for workshop participants to complete and return to Eleanor. You do not need an electro harp to participate! You can bring your own harp if you like but workshops will be fully catered for in terms of harps and electronics.